I've had these a few months now, bought from The Keswick Boot Company. Long enough now for a review. It's quite tricky to review footwear as the fit is absolutely paramount to the perception of how well a boot performs, and we all have subtly different shaped feet. What works for one person may not work for another. So there is bound to be quite substantial difference of opinions. Suffice to say, when buying any walking boots or shoes go to a good, preferably independent, retailer like the aforementioned Alex at Keswick Boot. These are a substantial looking boot that, in common with AKU boots in general, come out surprisingly light in weight. The upper is of grey leather suede with a little fabric at the ankle and the tongue. Ankle to toes is one piece of suede with even lines of stitching joining fabrics, leather and tongue. There is a wide rubber rand to protect the upper from rock damage. Laces go all the way to the toes (and are a little vivid in colour, as you'll see from the photo above I got Alex to replace mine with some black ones!). The top four laces anchors are hooks, the lower is a lace lock, to allow differential tensions and adjustments over the foot and ankle for optimal comfort. The sole is a Vibram® unit that can be resoled. The tread depth is good, and has a climbing zone at the toes for 'smearing' on rock. It's not a soft compound like climbing 'sticky boots' but does seem to hold onto rock well, and even relatively well in the wet - they don't instantly become lethal at the slightest hint of wet rock. The boot is Gore-Tex® lined, which can be a mixed blessing. Some people's feet sweat too much in a membrane lined boot, but I haven't found it to be a problem on this boot. The sole is quite stiff, perhaps not quite a B0 rating. This is something I quite like, a stiff sole doesn't make my feet ache on a long, rough day of rock and loose scree. Cushioning seems to be slightly on the soft side compared to other boots, but this isn't a criticism as it makes for more comfortable road or pavement walking. Fitting is of moderate volume, not excessive. I can wear them with the original insole, or with an orthotic. I think of my feet as slightly slim at the heel with a slightly wide forefoot. These fit snugly at the front without digging or pinching. Trying them on with my normal hiking socks I found I had heel lift, but this was fixed in the shop just by trying different socks. I can now wear any of my hiking socks with them without this re-occurring. A combination of the boot easing a bit, better tension in the right places, and my feet wearing into the boot. 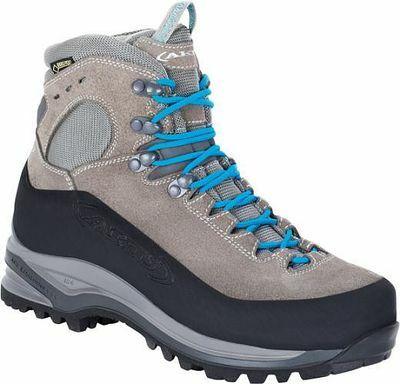 The boot is aimed at folk who want a good no-nonsense, light weight boot for tough mountain days out and backpacking, that fits well with my impression of them so far.